Red onion is very rich in acidic properties and can help lighten your dark/brown spots, acne scars and age spots easily. 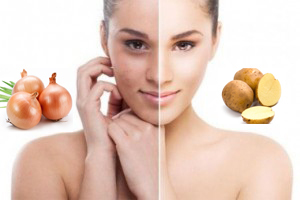 The acidic and bleaching properties present in onion, lightens the dark/brown spots. Cut one small red onion, grind it (or use juicer) and squeeze juice from it. Dip cotton ball in this fresh juice and apply it directly to affected area you wish to lighten. Leave it for 10-15 minutes and rinse off with lukewarm water. Apply honey as moisturizer and cleanse for 10 minutes. Rub the red or normal onion slices over the affected area for 5-10 minutes daily and then wash off and apply 1 teaspoon of honey for 5-10 minutes. Mix one tablespoon of fresh onion juice with one tablespoons of honey. Apply the mixture on the affected area for 15-20 minutes. Wash it off thoroughly with mild soap so that the strong smell of the onion juice goes off. Then apply honey for 10 minutes. You can also try garlic juice instead of onion juice. Mix 1-2 tablespoon of onion juice (normal or red onion) with 1 tablespoon of apple vinegar. Apply with cotton ball or finger tips. Leave it for 20 minutes and wash off with normal water. Mix 1-2 tablespoon of fresh onion juice with 1 teaspoon of rose water. Apply directly on affected areas, wash with normal water after 20 minutes. Do this every day for 4-5 weeks. Gently massage with slice of raw potato directly on the black spots; leave on for a 30 minutes and then rinse off with lukewarm or normal water. Grate half raw potato or grind it to squeeze juice of it. Mix 1 teaspoon of honey in 2 tablespoon of potato juice, mix well and apply on the face for 30 minutes. Wash off with cold water. Apply this mixture regularly for 5 weeks. Make fine paste of crushed potato and tomato, apply this paste before going to bed and wash after 20-30 minutes. Apply 1 teaspoon of honey, leave it overnight, wash in the morning with cold water.